Hello there i'm back again. Having successfully burnt AVCHD home movies I decided to go one stage further and invested in a blu ray burner. Despite some teething problems I have managed to burn a couple of BR discs from imsage files. However on playback I get lots of very brief 'freezes' which puts the audio out of sync. Have had several attempts,using both PC and laptop but with same result. I am relying on you gurus to help me out yet again. Have you played it on your PC or any other BD Player? How does it play? Used a VERBATIN BD-RE 25gb 2x Speed.I also tried a non-rewritable but forget which make and have disposed of it now. Am using a Samsung se-506 portable Writer and Panasonic player. Method (using laptop) - Load AVCHD Clips (have tried with no music,transitions or effects)/ Send to MyDVD / Select BluRay Option / Select High Quality / Burn to Disc / Save Image File only / then Select Burn to Disc / Get 'Project completed Successfully' message. However once playing get very slight video pauses causing audio out of sync. Can play on laptop using Writer via Cyberlink PowerDVD 9 but same result. PC - 'Graphics card incompatibLe (Video Connection type is Analog)' although can play by Open File / BDMV / Stream but not watchable. This gave me a FILE FOLDER. Then used it in BURN DATA DISC. Put in blu ray player. Message "No compatible content on the disc"
Is on the disc as plays (not very well) on laptop. Have I missed out something ? By the way in my previous message when I referred to converting to mp4 this was to produce an AVCHD disc not bluray. You have to do this for AVCHD don't you ? 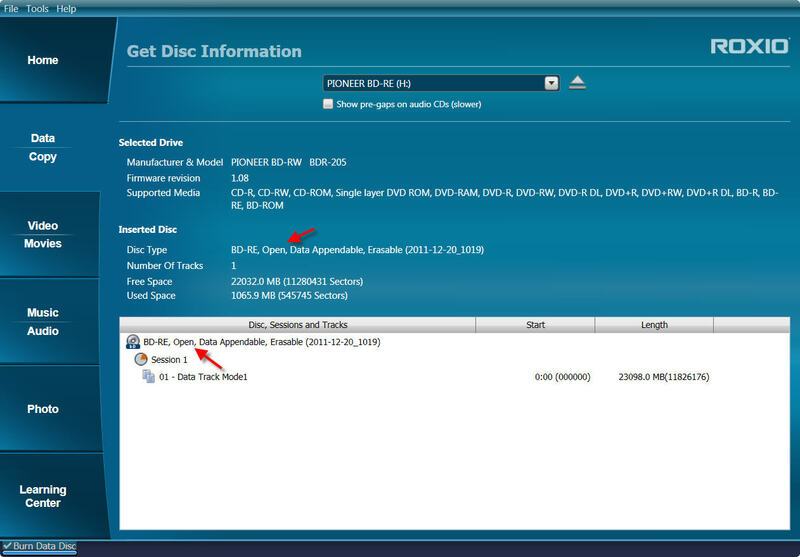 From the Home Screen, Tools, Get Disc Information. Post a screen shot looking at that disc, please. Mine the correct way closed DVD Video. Yours open data dependable not right. I don't use Burn Data Disc with a folder set like Mr. Hardin recommended to you. 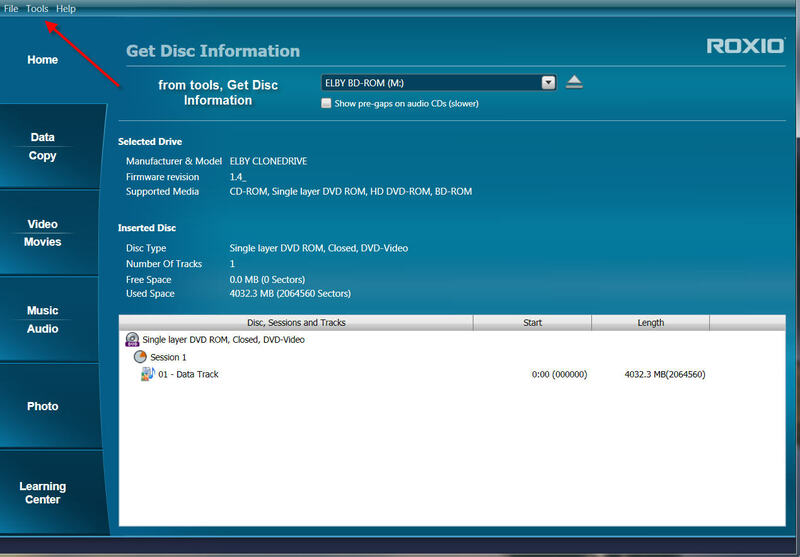 I don't know why he recommended you to bur/author a Blu-ray disc with burn data disc application. I do see what happen with your disc clicking on options tho. I burn it to a image file from MyDVD then use Video Copy and Convert or ImgBurn to burn it to a disc..
Had a quick look and think before I go out for the day, and while you are asleep ! Your is not a blu ray disc or re-recordable so would what you are saying work on mine ? if so where (and when) do I find the Options menu. Looked without success ! Maybe time for a screen cap of your Project in MyDVD??? I made a new BD folder set with MyDVD and a new BD ISO Image file with MYDVD, both Blu-ray 2D no menu. First one burned with Burn Disc Image. Second one burned with Burn Data Disc. When both BD-RE disc's were put in my Panasonic DMP BD65 settop player, the player read them then stopped and acted like it wouldn't play them! When I pushed the play button on the settop remote they both played. 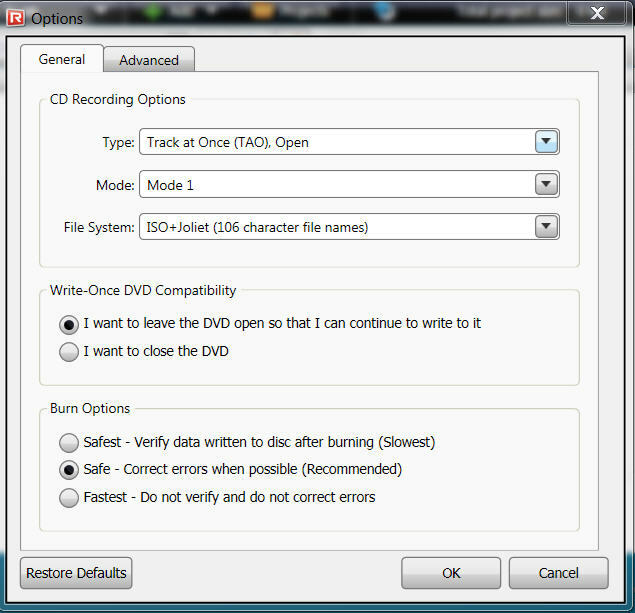 So neither way burning, Burn Disc Image or Burn Data Disc made a DVD BD that would auto start for me and my player! As we say in London "This is doing my 'ed in"
I have had numerous tries, taking on board your advice, with the same results. "this disc is not supported by your drive"
"this disc is not blank" and when trying to delete it "this disc is blank" ! So, I think I am going to give it a rest until the New Year - not going to be at home much anyway - and then start from scratch again. Thanks both for your help - just one unanswered question to CD - how do you get to the Options menu that you sent ? Perhaps the problem is really in your Player?? ?